Goals - Are You Game? One way to set writing goals is to play games. Let’s play a little game right now. Get a piece of paper and a pen. Write down a number between 1 and 12. For example, I will select four (4). Now using that number, write down that many numbers between 1 and 12. Using my example, I will need to pick and write down four numbers. As an example, I will pick 2, 4, 6, and 8. Wasn’t that fun? It is always good to do something a little different. (We will use these numbers later in the article). Why write? If you are reading this, it is possible that you are a writer. God gives gifts to people and then uses the gifts to shape who we are and uses us to influence the people and the world around us. Gifted? Yes, you are. I may have a specialty in working with “gifted” adults. They come to coaching and sometimes counseling with a level of confusion about being a little different. The difference is often a reflection of some wonderful treasure God placed in that person or has cultivated in their life. We don’t easily find out how to live with the expression of our gifts unless we do a little introspection and enlist the help of a few “guidance counselors.” Coaching is a great venue for gifted adults. This column is another invitation to write. God never rests from inviting us to grow in our relationship to Him, so why would a Christian Writing Coach miss any opportunity to invite you to write? This website is a result of many prayers. You share in a ministry when you write an article, give out cards to other writers and readers and when you take the time to read and give feedback. I hope you see that using your gifts can be fun. Last year you were working on developing consistent writing habits. This year, you can take your writing to a new level by using those numbers you just picked to establish your writing goals. Let the first number be the number of articles you will agree to send to NSOF, and let the second number be the months you will send them. In my example, I would send four articles. I would send one in February 2008, April 2008, June 2007 and August 2007. If everyone who reads this column will play the game, we will have a monthly newsletter with plenty of articles and new copy on the website every month. We may even be able to collaborate on more writing projects and compile some writing for publication. Will you start writing by sending a commitment email to the NSOF Editor with your two winning numbers? We will look forward to hearing from a record number of readers who are joining us in ministry with a commitment of articles. Let the games begin! In addition to celebrating spring, this is a great time to celebrate the first year of the Next-Step-of-Faith newsletter. Blessings to all of the faithful readers and especially each of you who have been contributing articles. 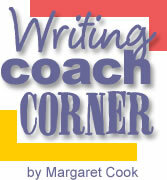 Over the last year, we have shared 10 coaching columns for writers. It was fun to have a monthly assignment to encourage a group of people pursuing a high calling. I have enjoyed hearing from some of you. Will you take a minute and write three things*** you enjoyed about the first year of this newsletter? As you plan your writing career, determine to have a periodic check-up and review your progress. It will help you stay on track and it can inspire you to set new goals so you can reach the Next Step. You may want to join us in doing an annual review of your own. Take stock of what you have written in the past twelve months. Then set goals for the next week, month and year. The clearer your goals, the easier it is to measure your success. Notice the word PRACTICE? That is the tip of the month. Set aside a time each week when you will practice writing. Create a time that you can keep. When developing a new life habit, you want to be able to incorporate this into your routine so that you will be able to regularly engage in your new skill. Set a goal and keep it between now and the next newsletter. Consider pairing it with something else you do – maybe it is 30 minutes while the sheets are in the dryer once a week. If your life is overbooked, start with ten minutes two or three times a week and try to pair it with something you love to do already. Writing is a discipline, a habit and a gift. Set aside a time and a purpose for your writing and then build your writing practice into your life. You may also want to become aware of the ways that you become more engaged in writing or situations that stimulate your writing process. Select your space and customize it for efficiency and inspiration. Put a favorite photograph near, have a scented candle, put your books for writing at hand and anything else that will make the space work. The more senses you involve the more powerful the learning and creative process will be for a writer. So go ahead, pick a strategy or two, and create a steady diet of putting a few words down. Then set a schedule for your regular appointments. Consider articles like check-ups. Do not wait until something “big” happens to write. Send an article once a year – or four times a year would be even better! Everyone is busy, but seeing your words in print and bringing your journal to an audience can do you a world of good as a writer. Having a good “diet” of writing habits is an excellent lifestyle for health. Add a little regular exercise and you will improve your health as a writer. Make a schedule of regular appointments or deadlines for turning in articles for publication. The publications will affirm your health and reinforce your choices to live the life of writing. One way to get started or to generate new ideas when you get stuck is to engage in a creative process. What gets your words flowing? Get ready to write your next article by trying this pre-writing exercise to warm up and create insights that can be included in your Next-Step-of-Faith article. This exercise is called “clustering.” You take a word or idea and put it on a page in a circle. Then you “brainstorm” related ideas around the thought you started with on the page. Each of the related words you generate can also spin into new relationships and ideas that center around the themes you are generating – hence, the term clustering. The writer can generate clusters of ideas that multiply off of each other and generate creative ideas that can be incorporated into the writing. Use the exercise to stimulate your creativity and don’t evaluate the ideas as you generate them. Let the ideas surprise you – like opening the packages under your Christmas tree. Work until your ideas stop coming and know that when you are finished, you can pick and choose what to include in your writing. Next month’s article will be about outlining and how you can organize the information you generate from this non-linear method of exploring themes to include in your writing. Outlining can be a pre-writing activity, but it can also be an invaluable writing tool throughout the writing process – including at the end. Think of a good outline as equivalent to a strong spine and a good skeletal structure for your body. What would your body be like if bones were missing, or your spine was not straight and able to support the rest of your frame? Being a writer for publication moves you from meandering on the page, to taking more control of the writing process to assure a level of productivity. If you hope to make a living at this craft, you will want your time to be profitable. The most important writing tool for this is outlining. As with every writing skill, the more you practice this, the better you get at outlining. If you want to improve your productivity and profitability of writing, work on outlining your pieces and using the outlining process to shape the time you spend on a work. In writing a short story or a novel, you will benefit from using multiple outlines. When is your game season as a writer? Are you on a year-long writing schedule, or do you seem to have a seasonal style? How do you stay in shape during your off season and how do you gear up to do your best throughout your writing season? Use this analogy to create a writing schedule for yourself. Engage in a variety of conditioning exercises and ways to bring new energy to your game. Having a team of other writers can make you more effective in reaching your audience and being published. Coaching makes a difference because a coach is able to offer a more objective investment in your success. Coaching can bring out the best and sustain winning momentum. Some people play baseball for fun and exercise. Some become professionals and devote themselves to the discipline of being in shape, identifying areas that need work and playing in the game at a level that allows them to stay on the team. Are you writing for the fun of it, or are you preparing to write professionally? There is a difference in how you prepare when you plan to write professionally. Discipline, conditioning and knowing the process that lets you produce the optimal results will set you apart as a professional writer. Have a regular routine for writing. Know the seasons of your sport. Make a commitment to revising and continuously improving your writing and learning/practicing writing skills. Seek feedback. Share your writing with various people to learn more about improving your game. Keep score. Find ways to evaluate how well you are doing and how much better you are getting. Love the game so you will play with all of your heart. Look forward to your writing experiences and make them fun. *** Go to the prior newsletters and re-read the articles and use the links to become more familiar with ways to improve your writing process. Take a few minutes and send the three things you enjoyed about the NSOF newsletter in the first year of publication. Send the list to: NSOF Editor . Keep writing and keep reading! Copyright © June 2, 2007 – Margaret Cook. All rights reserved.